After a recent SickBeard vs SickRage comparison, I decided to install SickRage on Ubuntu Server 14.04, replacing my SickBeard installation that has been working well for 2 years. 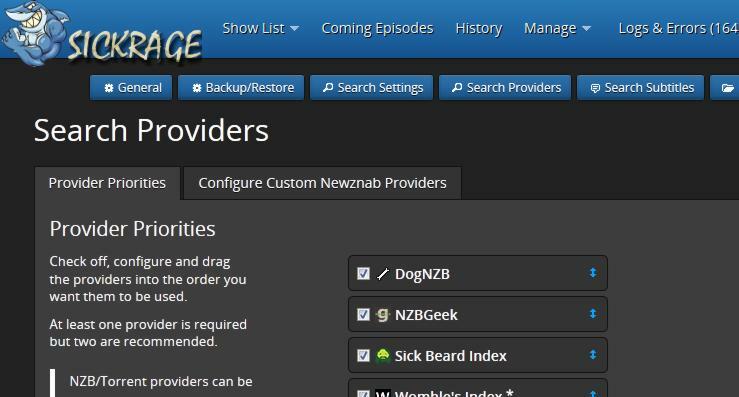 SickRage is a video file manager for Shows based on the popular SickBeard PVR. Like SickBeard, it also automatically downloads TV Show episodes when they become available. SickRage's unique features, including torrent and subtitle support, led me to decide that SickRage is better than SickBeard (at this point). You may choose to install SickRage on Ubuntu and other Linux distros as described in this guide or go with other SickBeard forks with torrent support. SickRage, also known as SickBeard-TVRage, has several advantages over SickBeard. The unique features are too many list and I suggest that you read up on my comparison of SickBeard and SickRage. Some key unique features include torrent support, subtitle support, backup and restore, better failed download handling, more search providers, custom naming schemes, and more. Alternatively, if you have an existing SickBeard app you may migrate from SickBeard to SickRage with little or no downtime. This will download the contents to the folder .sickrage. The “.” in the front keeps the .sickrage folder hidden. That is all there is to it. It is that easy to install SickRage on Ubuntu. For now, http://localhost:8081 should be enough. After you install SickRage on Ubuntu, follow my post on SickBeard configuration to get the basic SickRage configuration done. Configuration is similar to that of SickBeard's. After configuring your SickRage setup on Ubutnu, you may return to this post and continue. In order to make SickRAge function properly, you will have to install and configure SABnzbd to listen to downloads requests from SickRage. Refer to my guide on installing and setting up SickRage and SABnzbd to properly automate downloading Shows. As mentioned earlier, you will benefit from a reliable Usenet account. You may get a free Usenet account as described in this post, or go with a reliable Usenet service from Astraweb or Newshosting. That is all there is to SickRage installation. Go ahead Install SickRage on Ubuntu and enjoy. SickBeard vs SickRage – a better SickBeard alternative? How to migrate Shows library from SickBeard to SickRage?